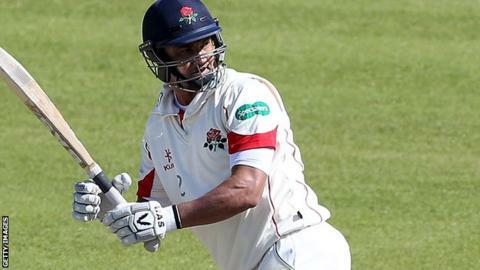 Lancashire clinched an eight-wicket victory over Nottinghamshire in their first match since returning to Division One of the County Championship. Lancashire, who were promoted from Division Two in 2015, began day four at Old Trafford needing 86 runs to win. Jake Ball removed openers Karl Brown and Haseeb Hameed cheaply, reducing the hosts to 27-2 on the final morning. But Alviro Petersen and Luke Procter saw Lancashire to their target before lunch, securing a win worth 22 points. Procter, who ended 35 not out, finished the match with a six over deep mid-wicket, as Samit Patel was hit for 19 runs off what proved to be the final over of the contest. Victory was set up by an excellent bowling performance from Kiwi seamer Neil Wagner, who took 11 wickets on his Lancashire debut. Notts' defeat was their first of the season, having beaten last summer's Division Two champions Surrey by three wickets at Trent Bridge in their opening Championship match of 2016. Lancashire captain Steven Croft: "After losing the toss on a pretty good wicket, that was one of the best bowling displays I've been involved with at this club. "It was a win against a really good side with a lot of international cricketers in it and we didn't scrape over the line as we usually do." Lancashire director of cricket Ashley Giles: "It was a really disciplined performance with the ball. That's got to be the benchmark, whether Jimmy Anderson's playing or not. "Neil Wagner has settled in straight away. He'd do anything for the team and clearly would run through a brick wall when he's got the ball in his hand." Notts director of cricket Mick Newell: "I'm a Liverpool fan. If we had been able to pull it off today, it would have been like (the 2005 Champions League win in) Istanbul or something like that. "It's been a disappointing game. We've played some poor cricket. We haven't batted well enough in either innings and that's been our undoing. "Jake Ball's been terrific. He's picked up six wickets in the game. He's got 12 wickets already. That's a fantastic start to the season and he's setting a great example. "Alex Hales will be available for the next game against Yorkshire and he will play. That's a given."